This topic covers comics that fall under the Fantasy genre. Fantasy comics have been around as long as the medium itself. In the US market, early years of fantasy comics began in the Golden Age of Comic Books and were populated with such notable works range from All-American comics' (and later DC comics') Greek myth inspired super hero Wonder Woman to Dell's Tarzan. 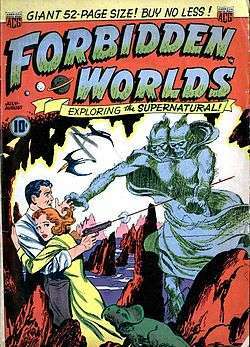 Starting in the late 1940s through the mid-1950s horror-themed fantasy anthologies gained prominence; the most famous of these include EC Comics' Tales from the Crypt, Haunt of Fear, and Vault of Horror; and lesser notable titles such as American Comics Group Adventures into the Unknown and Forbidden Worlds though this trend saw its prevalence cease with the publication of Dr. Fredric Wertham's book Seduction of the Innocent which directly led to a Senate hearing of the influence of comics on juvenile violence. Though fantasy comics were able to survive in this new atmosphere though in a diminished capacity compared to its much stronger output in these early years. Fantasy-themed super heroes continued to populate comics through the 1950s and regained popularity in 1960s with such characters as Steve Ditko's Doctor Strange published by Marvel comics and Jack Kirby's Thor both appearing in two of Marvel's fantasy-themed anthologies – Strange Tales and Journey into Mystery. In the 1970s, Conan the Barbarian, created by Robert E. Howard, became one of the most popular publications of Marvel Comics. After some changes of publishers, it continued to be published in the 2010s. In the 1990s, The Sandman, created by Neil Gaiman, Sam Kieth and Mike Dringenberg was popular. Several fantasy manga have been or will be adapted into anime television series, including Hakkenden: Eight Dogs of the East (2013), Akame ga Kill! (2014), The Seven Deadly Sins (2014), Trinity Seven (2014) and Akatsuki no Yona (TBA). ↑ "Hakkenden: Tōhō Hakken Ibun Fantasy Manga Gets Anime". Anime News Network. 27 October 2011. Retrieved 30 July 2014. ↑ "Akame ga KILL! Dark Action Fantasy Manga Gets TV Anime". Anime News Network. 20 January 2014. Retrieved 30 July 2014. ↑ "The Seven Deadly Sins Fantasy Manga Gets TV Anime". Anime News Network. 11 April 2014. Retrieved 30 July 2014. ↑ "School Fantasy Manga Trinity Seven Has Anime in the Works". Anime News Network. 13 February 2014. Retrieved 30 July 2014. ↑ "Akatsuki no Yona Shōjo Fantasy Manga Gets TV Anime". Anime News Network. 1 July 2014. Retrieved 30 July 2014.